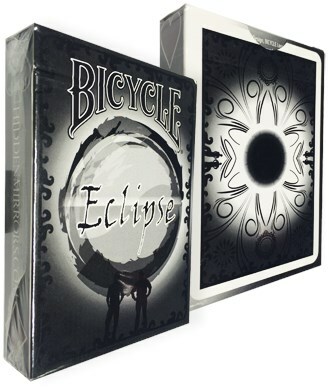 Eclipsed" Pips for Easy-To-Read Presentation - During card routines of any kind, showing a card needs to be easy to see and remember, black cards with dark color pips are harder on the spectators eyes and are forgotten a lot more often, lessening the impact of your prestige. Even for a game of cards, straight at dark cards for a long period of times can be hard on the eyes. The "Eclipsed" Pips makes every pip easy to read up-close and from far away. These are the type of designed features only thought of by actual working magicians or card flourishers. Unique Art Work on EVERY card - For too long, people have gotten away with custom royal cards alone, how many decks have you open to just see the Ace of Spades, Jokers, and the Royal Cards while not really having great Face cards? We have taken the time to add a unique touch to each card with 1 odd pip randomly placed. No 2 cards are exactly the same in Design, making each card worth looking, bringing the Spectator in just a bit closer for every card you present, not just the "Special" ones. "Full-Moon" Aces - The Aces are special cards to everyone. The Ace of Spades will always hold the number 1 spot, but for too long, the other 3 aces have been given zero attention by card makers. That's why we designed "Full-Moon" Aces. Enhancing all your Ace routines, with larger, more impressive Aces. 4 Trick Cards - Joker Routines are enhanced with the facing jokers, now, sandwich routines will give the illusion the jokers are literally working together to pick up the spectators card. And 2 more special cards give you several easy ways to use options that most decks do no offer. Finest Quality Available from the USPCC- Premium cards look excellent and handle even better. These are Bicycle Brand decks, we worked closely with the design team at Bicycle to make sure every possible feature was included to make these cards handle just as good as any premium card available. That means the best Bicycle Paper-Stock available and the must-have Magic Finish.